The Charleston Golf Week Amateur Tour traveled out to the beach on Sat to the Isle of Palms to tackle the Harbor course on what turned out to be a very nice February afternoon. The tournament marked our second sell-out in a row and for those that played, we enjoyed a great time. The Champ Flight had new comer Paul Ponder fire a great round of 77 from the tips which is now easy feat at the Harbor course. He finished 4 shots up on another new-comer, Brooks Harlow. The A flight saw the round of the day as Dennis Slezak posted a spectacular round of 73. His steady play was to much for large field in the A flight. Fred Dixon posted a very nice 77 to take home second place while Stephen Kauble and Dan Wanner both shot 79 for a tie for third. Stephen prevailed on the scorecard playoff. The B flight saw another first time winner as New Member Randy Tame blisted the back nine with a 34 to capture his first ever Golf Week Tour Title. 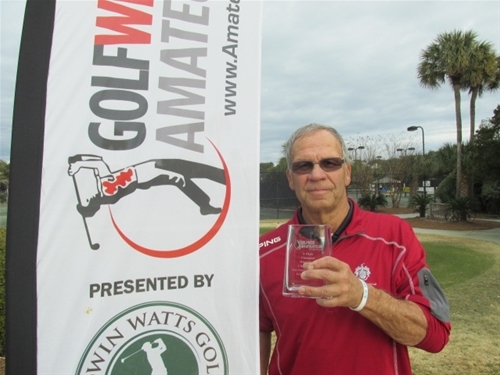 Coming in Second place was Jerry Mast who posted a solid round of 81. Matt Root and Jack Sudol from Myrtle Beach both finished with 82's and Matt prevailed with a show of cards. The C flight saw last years C flight winner get his first victory of the year as Jason Courtney carded a nice round of 85 to finish in first place 2 shots ahead of steady Michael Sams who shot a 87. The D flight saw Brandon Bray capture his first victory of the year as he carded three birdies on his way to a round of 92, two shots ahead of the hot Aaron Chase. Overall it was a great day as the weather cooperated and course played very nice and fast as all golfers completed their rounds in under 4 hours 20 minutes. Our next event will be the shoot out at the Links of Stono Ferry. I have 28 guys signed up so far so please put your name in soon.